After more than 14 months since Emory University ordered our arrests, we have recently been notified that a DeKalb County State Court judge has placed the matter on the dead docket. This means there will be no further prosecution of our case at this time. This is a moment of great relief, filled with gratitude for the many family members, friends, professors, and workers who have supported us throughout the last year as we dealt with the stress of facing criminal prosecution for nonviolent dissent on our own university campus. However, we remain focused on the well-being of contracted workers at Emory, who continue to hold a second-class position in our community and face violations of their human rights during the school year and summer months. Contracted workers are not entitled to the same benefits and privileges that Emory employees enjoy. There is not a space at Emory where they can participate in decision-making on matters that impact their lives or any institution at Emory that is responsible for how they are treated. 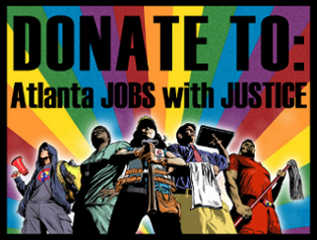 Contracted workers do not have access to free MARTA passes through the “Emory Transit Subsidy Program” that other workers at Emory are entitled to. The least paid workers on our campus should not bear the heaviest financial burden of getting to and from Emory. For most contracted workers, the end of the academic year signals a time of impending hardship, as they are effectively laid off for the summer. This temporary and seasonal nature of work, created by the structure of the academic calendar, makes contracted workers especially vulnerable to intimidation or abuse in the workplace. If they speak out, they risk not being rehired for the next school year. Sodexo’s mandatory closed-door, anti-union meetings at Emory’s campus facilities are a clear example of such intimidation. Such practices of intimidation threatens workers’ rights “to just and favorable conditions of work” and “to form and join unions for the protection of their interests” as outlined in the Universal Declaration of Human Rights (UDHR). Emory must ensure that all workers on its campus are able to work in safe environments free of intimidation or fear of reprisal. The hardship and undue suffering experienced by those who serve food or provide other essential services at Emory should concern all of us. True, Emory itself is not directly intimidating contracted workers, laying them off every summer or holiday break, or denying them access to unemployment insurance. However, if contracted workers provide for the Emory community and Emory in turn benefits from their labor, Emory is ethically bound to ensuring they are treated with dignity and respect. In the words of Rabbi Abraham Joshua Heschel: Few are guilty, but all are responsible. After more than two and a half years of investigating these issues and having dialogues with the community about possible solutions, SWS’s recommendations to 1) institute a President’s Commission on Class and Labor, 2) implement a Ethical Code of Conduct, and 3) make free MARTA passes available to all workers at Emory without discrimination, have either been ignored, dismissed, or only partially adopted. Specifically, in response to SWS pressure, Emory administrators established a temporary Committee on Class and Labor. While the Committee is temporary and has limited transparency, it is a promising first step. We hope their recommendations, due later this summer, will include the establishment of a permanent body to ensure workers’ rights and the immediate inclusion of contracted workers in the Emory Transit Subsidy Program so that all workers have access to free MARTA passes. A permanent institutional body, accountable to the Emory community, would set and implement new policies like the elimination of closed-door anti-union meetings on Emory’s campus and investigate the adequacy of Emory’s “living wage” standard in light of significant periods of unemployment and denied access to unemployment insurance. In short, it could help ensure fair and equitable labor standards for all employees at Emory. Keep in touch! Email us at swsemory@gmail.com, or find us on Facebook. Wondering how you can help? Contact Emory President James Wagner: james.wagner@emory.edu, 404-727-6013, and encourage him to make free, subsidized MARTA passes available to contracted workers (just as they are made available to other Emory employees) and form a permanent Committee on Class and Labor.